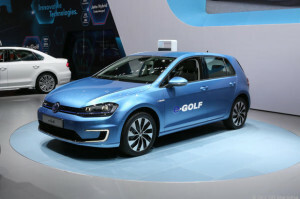 The Volkswagen e-Golf electric vehicle is set to go on sale in Germany and parts of Europe in the Spring of 2014 – the US will follow in the fourth quarter of 2014. Now that the e-Golf is available in some European countries, and can be pre-ordered in the UK, full specifications have been released by Volkswagen. The electric motor in the Golf is rated at 114 horsepower and 119 lb-ft of torque. The acceleration is timed at 10.4 seconds to go from 0 to 62mph. A 24.2 kWh lithium-ion battery pack powers the Golf, and gives a range of around 118 miles on the NEDC test cycle – that puts the range somewhere around 80 miles for the North American test. The Volkswagen e-Golf electric motor is rated at 85 kW and provides drive power, linked to the front wheels through a single speed gearbox. Charging times are 13 hours on a standard wall socket, and 8 hours with an optional ‘wallbox’. Using the combined charging system and a DC supply, a quick charge from flat to 80% can be achieved in 35 minutes. Different than other electric vehicle manufacturers, Volkswagen has decided to offer an optional heat pump. Using heat from ambient air and the vehicle’s drive system, Volkswagen says it can extend the cold weather range on the electric Golf up to 20%. The e-Golf is the first production Volkswagen to use full LED headlights. They produce brighter light, and of course use less electricity than the typical xenon bulbs. To set the e-Golf apart from the gasoline powered Golf, the automaker has added blue stitching on interior upholstery, as well as a signature blue strip that runs the width of the radiator grille and into the headlights. The e-Golf also has unique C shaped LED daytime running lights in the front bumper. The e-Golf’s 24 kWh lithium ion battery pack is covered with an 8-year, 100,000 mile warranty. Volkswagen says they developed the battery pack with the “intention of it having 80 per cent of its original capacity after 10 years’ use.” The target is based on an electric vehicle travelling about 9000 miles annually.